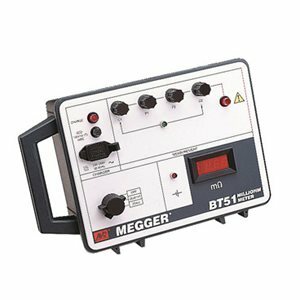 The BT51 Low Resistance Ohmmeter makes measurements by passing a current through the conductor under test and also monitoring the voltage across it. The test current is limited by a simple current limiting circuit and is measured by monitoring the voltage across a resistor. The test current is maintained at a nominal 2 A, and as the measurement is ratiometric, the reading is unaffected by any current variations.